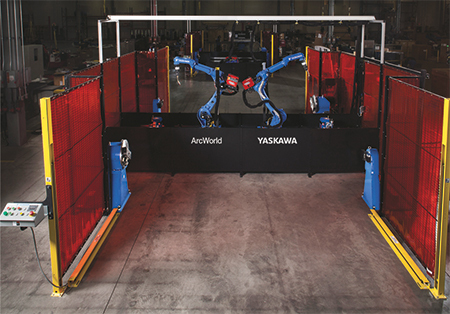 The new ArcWorld 2000 welding workcell displayed at FABTECH by Yaskawa Motoman is a modular solution designed for robotic welding of large workpieces—described as “perfect for low- to medium-volume manufacturers with a medium to high mix of parts.” Maximum part width: 5 m, with payload capacity to 6300 kg. The workcell features one or two six-axis welding robots directed by a DX200 controller with menu-driven arc-welding application software, an integrated welding package (power source, wire feeder and torch), positioner(s), operator interface and safety barriers. Users can scale the cell scales from a single-station layout to a two-robot dual-station configuration to adapt to changing production demands. Two-station layouts can be configured with a “blank station,” allowing the user to install its own equipment, and each station can have a different positioner.